Ahead of a busy end to the domestic season and then the World Cup, five-time Ballon d’Or winner Messi wasn’t going to risk aggravating his injury. 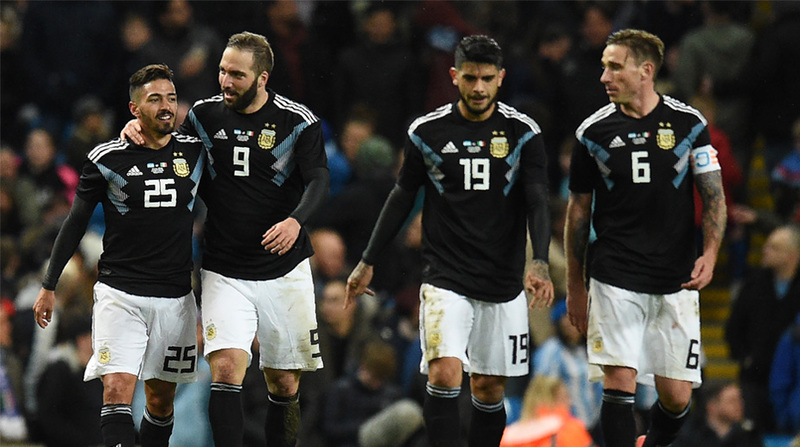 Ever Banega ensured Argentina weren’t derailed by Lionel Messi’s absence as the World Cup contenders clinched a 2-0 win over Italy in a friendly at the Etihad Stadium. Messi reportedly suffered an groin strain in training on Thursday, so the Barcelona forward was an unused substitute as Argentina kicked off their preparations for the World Cup in June. Without their talismanic star, Jorge Sampaoli’s side showed they have strength in depth with a solid display capped by late goals from Banega and Manuel Lanzini. Having edged through to the World Cup thanks to Messi’s treble in a 3-1 win over Ecuador in October, Argentina are focused on peaking in Russia, where they will play Croatia, Iceland and Nigeria in the group stage. Clearly they need Messi to have any chance of lifting the trophy, but, with Sergio Aguero also sidelined by injury, Sampaoli will be encouraged by the performance of his understudies. “We played this game as a final,” said Sampaoli, who is set to be without Angel Di Maria for next week’s friendly against Spain after he suffered a thigh injury. Italy remain in turmoil after failing to qualify for the World Cup for the first time since 1958. It was an emotional evening for the Azzurri as they played for the first time since their defender Davide Astori died of a suspected cardiac arrest earlier this month. “We suffered with their control of possession and lost some shape,” Italy boss Luigi Di Biagio said. “We deserved more in the second half but let’s not forget who we were up against. “The group must develop. There are a lot of youngsters who need experience. Di Biagio is in charge of Italy on an interim basis and his first move was to persuade Juventus goalkeeper Gianluigi Buffon to end a brief international retirement. Buffon, winning his 176th cap, was quickly called into action as Di Maria tested the 40-year-old with a low strike. It took another good stop from Buffon to keep out Nicolas Otamendi’s header. Although Argentina and Italy have won six World Cups between them, there were large swathes of seats left empty as the Manchester public showed a lack of enthusiasm for two teams whose current squads are far from their finest vintage. The stay-aways weren’t missing much, with chances at a premium until Buffon made an alert save to deny Nicolas Tagliafico. Buffon saved his best for the final seconds of the first half as he repelled a shot from his Juventus team-mate Gonzalo Higuain before Daniele Rugani cleared the rebound off the line. After their tame opening, Italy improved in the second half and should have been ahead when Leandro Paredes’s woeful backpass was intercepted by Ciro Immobile. Immobile set up Lorenzo Insigne with just Willy Caballero to beat, but the Napoli forward fired wide. The crowd began chanting for Messi to be sent on, but their appeals were in vain. Chelsea keeper Caballero saved well from Immobile, Antonio Candreva and Insigne as Italy enjoyed their best spell. But, in the 75th minute, Argentina punished Di Biagio’s men for their lack of cutting edge. A flowing move reached the edge of the Italy penalty area, where Sevilla midfielder Banega arrowed a low strike past Buffon to the delight of the watching Messi.